Of course! The Girl! That's why I wasn't getting any signups. Looks like the whole universe is spinning around a girl sometimes.. Here are some more banners to feed upon.. I mean I forgot to make the 468 ones as well.. Yes me too, but since I've only used free advertising on them I don't mind. I'll most likely use some PTC advertising on the site to see how it goes. Though only 1 sale was achieved, I've never seen such CTR results in any banners I've used in the past. I'll soon re-run the test with the same number of views using the new banners on BoB. I'll probably use paidverts, clixten and ultimateclixx for that purpose for now. I think that the fact that you can only join by paying may be a big deterrent. When the sites we promote are free to join, usually a high CTR leads to better results. But since investment is required, maybe the source of traffic is more important. Yes, it's been my experience. That it's more challenging to get referrals in a "paid-only" program. True.. I also remember myself not liking anything that required me to pay to get in.. I mostly turned them down. Unless something was really really interesting or recommended by people I really trusted. Also matrices were never my vantage point, but well now I see things in a whole different point of view. Sometime what I do in a program like BoB is to just promote the banners whereas I get to benefit from each click anyway, like referring page credits, etc. Also, what I do is to also promote the programs in BoB whereas I'm already promoting the BoB exchanger in them, thus creating good synergy with the programs. 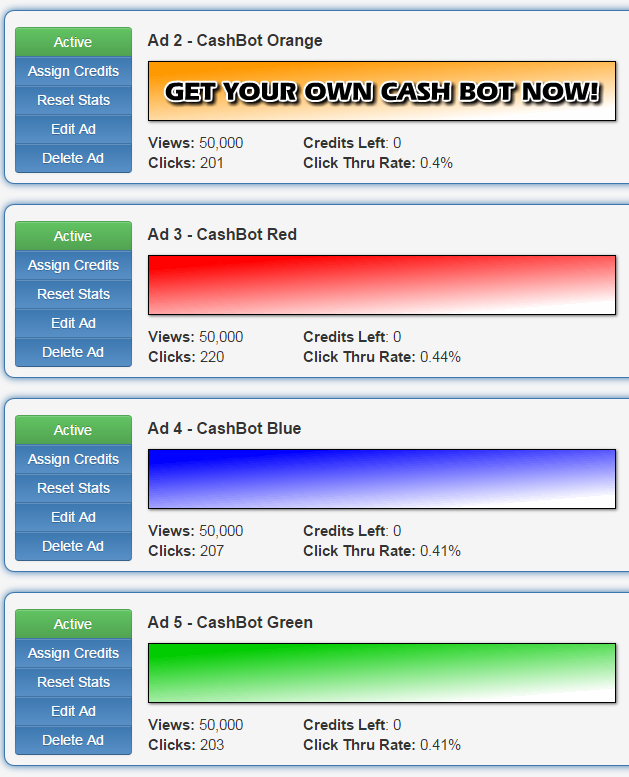 Just for the record, I decided to run a banner ad campaign for a day on top10ptc.com @ $6 and see if it generates any sales on cashbot. I'll let you know if I have something.. So. no luck with top10ptc and I can't track the clicks so.. I'll now run another campaign on TrafficG and BoB using the new banners to see if that leads to any better results. So, I'll keep you up to date with them, when they end. I've definitely cut back advertising it. The fish just aren't biting. I'll still advertise the banners but not in a big way. Just a test ad here and there to see if people go for it. I did suggest to him that he allow people to put their own banners on the page so as to give more tangible benefits to the site but he did not answer me.